Santa Cruz County Creating Change Youth Delegates & Chaperones at the 2018 Creating Change Conference in Washington, D.C. The Creating Change Conference is one of the largest annual gathering of LGBT activists, organizers, and leaders in the United States. Approximately 4,000 people from all over the country attend the five-day program that features over 390 workshops, training sessions, meetings and events, and four plenary sessions. The conference rotates around the country every year to provide regional access. In 2019, Creating Change will be held in Detroit, Michigan. While Creating Change is not a youth-focused conference, it is very powerful for students to participate and be immersed in the LGBT movement and hear from national leaders throughout the country. There is a “youth-track” but these tend to be attended by mostly college-age young adults. Testimony from high school delegates confirms that the event is profoundly influential even though it is not geared to a high-school age audience. 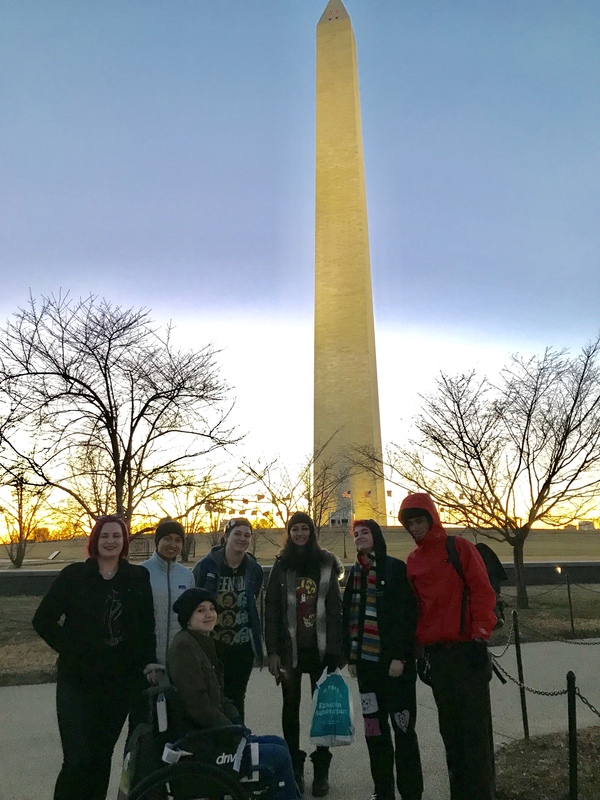 Why does Queer Youth Task Force help send high school students to a LGBT national conference? The Queer Youth Task Force helps send high school students to Creating Change for the following reasons: 1) to support youth in developing positive queer identities, 2) to combat the isolation some queer youth feel by expanding their sense of belonging to the larger LGBT movement and 3) to build leadership capacity so that they might influence change in their own communities. Who is sponsoring the 2019 Santa Cruz County Creating Change Youth Delegate Project? In 2019, Santa Cruz City Schools (SCCS) is the sponsor. They are providing the lead chaperone and arrangements. Derek Kendall, Soquel High School Assistant Principal of Counseling and Guidance, is the lead chaperone. 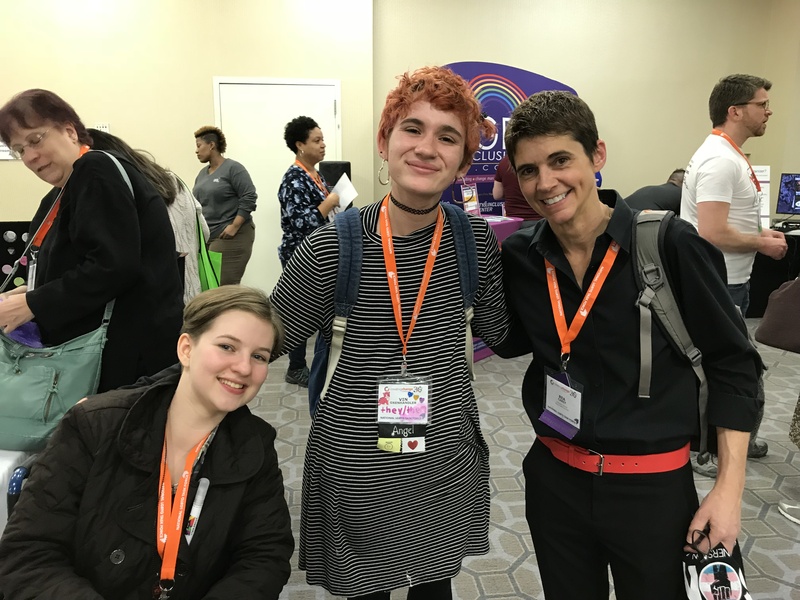 2018 Youth Delegates Wren Reeve (left) and Vincent Oxenhandler (center) with Rea Carey, Executive Director, The National LGBTQ Task Force, organizers of the annual Creating Change conference. Will my child be supervised? Your child’s safety and comfort is our primary concern. First, they will be provided with chaperones vetted by the Queer Youth Task Force in partnership with the sponsoring school district. All chaperones have been fingerprinted, trained in first aid, and are generally current high-school teachers who have direct experience working with LGBT students. The chaperones help students plan their day and maintain direct contact with them as they attend workshops. They also debrief with them at the end of each day. Chaperones are prepared to notice and address any signs of homesickness or stress and help the students navigate the conference experience for maximum ease and benefit. Parents will have the opportunity to meet the chaperones prior to the event and will be able to check-in with them as needed during the course of the conference. What if my child has a health concern or disability? We welcome all students to apply regardless of abilities. We hope that if your child is chosen to attend and has a physical or mental health concern that you disclose this information to the chaperones so that they may best accommodate you. What arrangements will there be for travel, housing, and overnight stays? Students will travel to the conference in a group with all of the other youth delegates and the team of chaperones. The sponsoring school district in conjunction with the QYTF makes all travel arrangements in advance including transportation to and from the airport. Students meet at a central location and travel by van to the airport. A parent wanting to transport their child can meet in the designated location and caravan. Depending on how many students and chaperones attend the conference in a given year and the location of the conference, several options for lodging are considered ranging from hotel to a vacation rental that can accommodate a large group. Food restrictions and arrangements for medications will be fully honored. These must be made in advance in the health section of the application. Students are expected to take the lead in addressing food and medication needs. 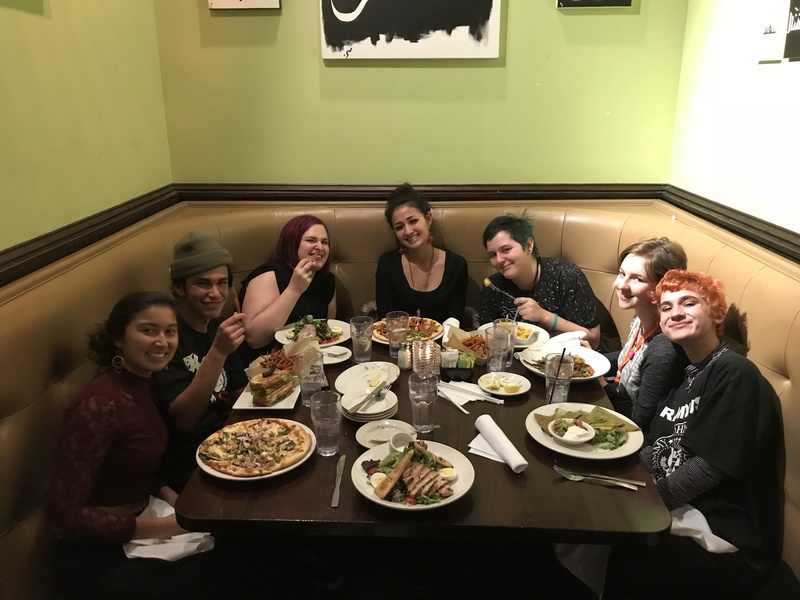 Youth Delegates and chaperones at Busboys and Poets, Washington, D.C.
What accommodations will be made for homework and missing school? While we consider Creating Change to be a “living classroom” and the conference is a school-sponsored event, we understand the importance of not letting students fall behind in their academic work while they are away from school. Time will be designated for homework/study hall daily. Previous delegates have found it helpful to notify teachers in advance and make arrangements to take exams or finals, and get schoolwork in advance. Ultimately, it is the student’s responsibility to communicate with their teachers and complete work according to the arrangements they make. What are parents expected to contribute financially? Students are expected to contribute to the cost of the conference but this financial obligation will be covered via student fundraising. The only money students will need to provide on their own is spending money for the duration of the conference. Meals, lodging, transportation, and conference registration are covered by delegate fundraising, donor contributions, and grants. What are parents expected to arrange? What expectation are there for my child? Youth delegates have four important responsibilities: 1) fundraising beforehand to help pay for the conference, 2) participating in pre-conference meetings and workshops to prepare 3) attending a post-conference debriefing and (4) completing a community service project upon returning from the Creating Change conference. Parents are welcome to contact us with any additional questions! Thank you to the 2019 Santa Cruz County Creating Change Youth Delegate Program sponsoring school district!